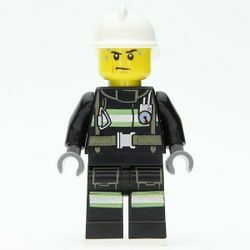 Blaze Firefighter is a minifigure released in 2014 as part of the LEGO Movie theme. Blaze makes reuse of a firefighter design originally used in a 2013 City wave with a harness and reflective tape on both his arms and legs. He wears a white helmet and has a serious expression with beads of sweat running down from his forehead.